For the posting, we are defining success to be the end result of a society having a state (instead of a band, tribe, or chiefdom), having the written language (not just oral traditions), having technology (metallurgy and seaworthy vessels), and having a large population supported by agriculture. A society is successful if and only if all the parts are working in harmony. Like a family, if anything is out of balance the family is dysfunctional. One key to success comes from food production. Those who were able to establish villages and grow an abundance of food had larger populations. It did not take everyone in the village to grow food like a band of hunter gatherers. Because of the abundance of food certain members of the village became specialists advancing the technology of the people. Those specialists made more complex tools like nets and fishhooks and shaped stone tools. Next, comes selection of food. All native people learn the properties of their flora. Those peoples with a large selection of domesticatable plants were ready to have a successful farming culture instead of a hunter/gather culture. The Fertile Crescent, the heart of modern civilization, had the most native flora that were able to be easily converted into domesticated crops. These plethora of crops allowed the people to have an abundance of food and a healthy diet. This increased the societies population, which in turn led to more battles won against their hunter/gatherer competitors. Sharing is another key to a successful society. It was not just the Europeans that were successful. The Chinese were prolific and populated most of south east Asia and developed advanced technology. Technology and crops were shared across and Europe and Asia. The East/West migration was easier on the crops shared due to similar seasons and daylight hours. North/South migration was hard in the Americas due to the desert in Mexico and the tropical zone. Additionally, the narrow isthmus of central America connecting north and south America was a natural boundary. Africa has its own natural barrier to the North and South with the Sahara desert. For example, corn domestication took place in Mesoamerica, around 5-6,000 B.C. It wasn’t until thousands of years later that it was domesticated in the Eastern North America. Whereas the spread of wheat from the Fertile Crescent in 10000 B.C. took only hundreds years to spread across Europe and Asia. Another tenet of success is the domestication of animals. Draft animals allow tools to break through the tough ground and provide a source of protein for a people. Animals that evolved and adapted with increases in human technology allowed them to survive. That is why Africa, Europe, and Asia have a lot of large mammals. You might notice that the Americas and Australia lack large animals that could have been domesticated like the major five: Sheep, Goat, Cattle, Pig, and Horse. Humans migrated to the Americas and Australia around 14000 B.C. In the fossil record there exists animals that met the criteria to become domesticated. There are some theorists that say climate change led to the extinction of these large animals. (However, I don’t see why they would survive 23 ice ages and then die out on the 24th) The more likely scenario is that human hunting technology ran into animals that had no previous experience with humans. They were quickly slaughtered and eaten. Why farm when you can just go and kill yourself some woolly mammoth, giant sloth, or giant kangaroo? The high technology humans killed most of their potential draft animals. The only draft animal to come from the Americas is the Alpaca and Llama. These diseases when brought to an unexposed people caused untold hardship and misery. An average of 9 of 10 people were killed by diseases out of the native populations. However, disease and crop production is a two way street. There is a reason why Europeans had a very difficult time populating the tropics. The first being malaria. There are 5 common genetic traits found in tropical people that help protect them against malaria. One evolutionary change, sickle cells instead of round globular red blood cells protect against malaria. While a negative trait in temperate zones due to anemia, it does a good job keeping you alive in the tropics. The second reason is that the Europeans crops did not translate well from the European climate to the tropical growth zone so the Europeans had a hard time growing their food. 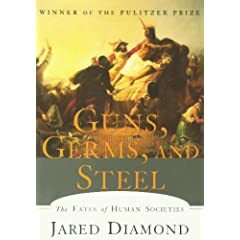 Guns, Germs, and Steel is not a page turner. It beats you into submission with facts. While all the content if very useful everyone might not find it interesting. (especially Creationists, i.e. those who prefer ‘Truth’ instead of facts). I personally had a difficult time finishing the book because a 100 pages of how crops migrated can make you quite sleepy. However, it does repeatedly demonstrate with examples the theories that Mr. Diamond has formed. Overall, I think this book is worth reading if only to destroy the arguments of those individuals that might suggest that your skin color has anything to do with the success of your society. But it would take a long time to divest all the required information to your opponent. People tend to prefer easy answers like ‘genetic defeciency’ instead of it all begins with food production, availability of domesticatable crops, availability of large draft animals, disease resistance, large populations, natural resources, and technology. It must be back to school time. There have been numerous searches for ‘Fertile Crescent’, did someone not finish their summer reading list? Anyway, one might ask, “Why did the people in the Fertile Crescent with their head start in agriculture and livestock not take over the world?” The answer is pretty straightforward. 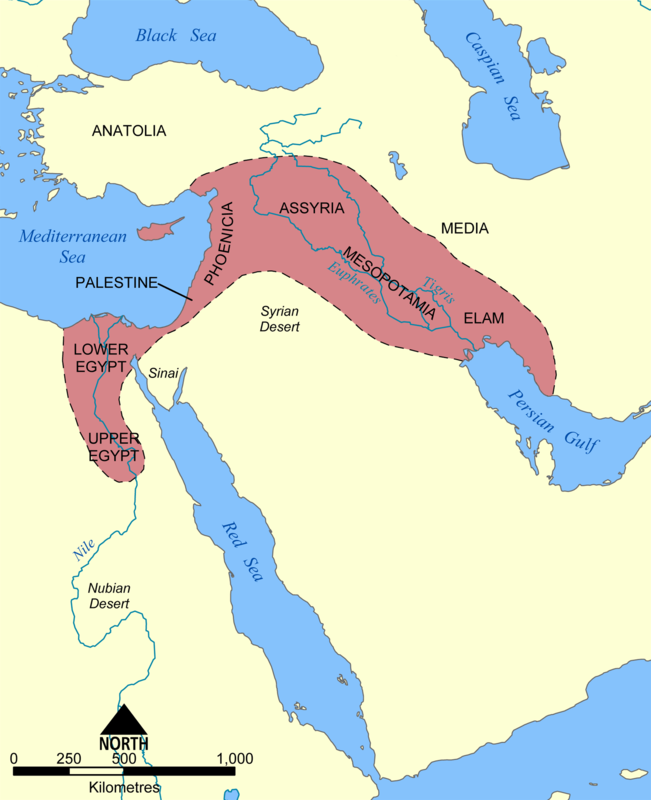 The fertile crescent is slightly more arid than that of northwestern Europe. When the Fertile Crescent peoples cut down all their trees to make things it led to desertification, whilst Europeans had wood as an easily renewable resource.